RTA: Damned if you do, etc. Dear RTA, I know you justÂ spent a lot of money finding out exactlyÂ how unpopular you are – now I’m telling you why. This one’s on the house. Think of this as an (il)logic puzzle. Want to renew? Go get a green slip. 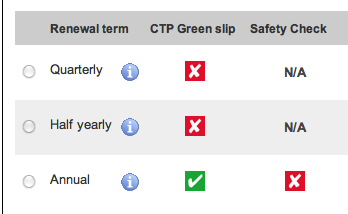 Got a greenslip? Go get another safety check. Want to just give us money and do the others out of order? Nope, sorry, you can’t do that. N/A in the Safety Check column actually means “you’re covered for now, don’t sweat it” – but you wouldn’t know it from the form. There’s a vicious red X if you’re not covered, but nary a tick if you are.Â Also, what’s with the grotesquely antialiased “i” rollovers?